The Fujinon HF9HA-1B is a very high quality C-mount lens with an F/1.4 aperature, adjustable focus and iris, and locking screws. 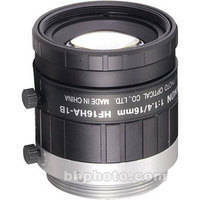 15mm F/2.2 fixed focal length lens designed for 1/3 Format 3-CCD Cameraas. Minimum working distance is 0.1 meters, features a M25.5 x 0.5 threaded filter mount. 2.8mm F/2.2 fixed focal length, desgined for 1/3 Format 3-CCD camera with C-mount. Low distortion design suites a variety of high quality imaging applications. 25mm fixed focal length with an working aperture of F/2.2 to F/16. C-Mount design. Compatible with 1/3 Format 3-CCD camera. Minimum working distance of 0.2 meters. 8mm Fixed focal length lens with F2.2 to F/16 working aperture, designed for 1/3 Format 3-CCD cameras with C-Mount. Minimum working distance is 0.2 meters.